Chicago Public Library Commissioner Brian Bannon was joined by NPR Wait Wait… Don’t Tell Me host Peter Sagal, and program sponsors Allstate & BMO Harris, to announce the selection for the Library’s One Book, One Chicago 2014-2015 program to be The Amazing Adventures of Kavalier & Clay by Michael Chabon. 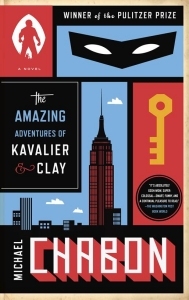 The Amazing Adventures of Kavalier & Clay is storytelling at its best. Set amid the backdrop of the rise of fascism and years leading up to World War II, Chabon transports readers into the exciting world of comic books, heroes and superheroes. Celebrated author Michael Chabon will visit Chicago Public Library on October 9 at 6 p.m. for a conversation about his novel. Beginning in October and continuing through spring 2015, meet a new local hero as introduced by a local author. Chicago authors will reflect on heroes from the past, present or even imagined, in this series of short essays. Essays will be released online for free the first Friday of each month at onebookonechicago.org. For more information, visit chipublib.org or call the Chicago Public Library at (312) 747-4050.